This eerie and unsettling sound a wooden door makes means that it’s trying to tell you that its hinges are rusty or in a dilapidated condition. You can oil your door hinge as a patch solution, but the problem will still return after a while. Wood doors are more susceptible to warping or bowing due to moisture damage. This causes blemishes on the surface of the door frame. Once your door begins to warp or bow, air and heat could easily escape or enter your home. Air leaks are common among old wood windows and doors. That is why you must make sure your door or the frames of your windows are resistant to any seal and moisture damage as such issues increase your energy use and causes your bills to skyrocket. This happens when your door frame doesn’t allow you to shut your door completely. Wood is actually a porous material, meaning that, without proper protection, it expands when exposed to humidity. Not only will you waste plenty of energy, but this problem also leaves your door vulnerable to mold formation and weakens the security of your home. A hard-to-operate door is a door that should be replaced. Once you experience difficulty in closing and opening your door, you should call your trusted contractor to create a plan to restore it or to install a new door. 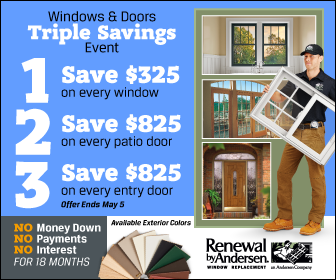 You can rest assured you won’t experience these issues with the quality doors from Renewal by Andersen® of St. Louis, the leading door and windows company. We pride ourselves on manufacturing long-lasting doors and windows. You can call us at (314) 332-2364 for more information about our products and services. You can also fill out our contact form to schedule a consultation and get a free project estimate. We proudly serve homeowners in Chesterfield and other areas in Missouri.